After 374 years, change doesn’t come often for the the Ancient and Honorable Artillery Company of Massachusetts. But last week, the military organization broke with tradition: Members for the first time voted two women into their ranks. Lieutenant Colonel Catherine M. Corkery and Lieutenant Colonel Christine Hoffmann, both officers in the National Guard, were voted into the group by an overwhelming majority last Tuesday. They will officially be inducted Sept. 17. The Ancient and Honorables is the third-oldest military organization in the world, just a few decades behind the Honourable Artillery Company of London and the Vatican’s Pontifical Swiss Guard. It got its start in 1638 as a group of militiamen tasked with protecting the Commonwealth from foreign invasion, civil unrest, and attacks from Indians, said the organization’s captain commanding, Paul Colella. As the military came under federal auspices, the group transitioned into a more ceremonial role, appearing in city parades, fund-raising for veterans’ associations, and delivering a reading of the Declaration of Independence from the State House balcony each Independence Day. The organization’s headquarters, on the fourth floor of Faneuil Hall, also serves as a museum commemorating the city’s historic role in the country’s military conflicts. Once per year, members travel to a foreign country to serve as military ambassadors. This year, they are headed to Russia. “Anyone who’s been in the military would find our company to be a place of kindred spirits,” Colella said. Last spring, members of the group approached Hoffmann and Corkery, encouraging them to consider applying for membership. The vetting process is rigorous, requiring attendance at group events, an interview with the election board, and sponsorship from an existing member who can vouch for an applicant’s character. Hoffmann, 49, had those credentials in spades. She has spent 25 years in the Army National Guard, serving two tours of duty in Iraq. 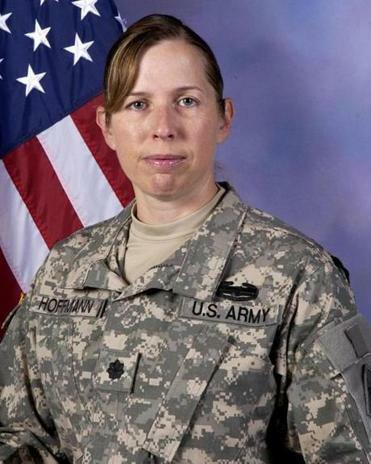 For her, joining the group was an opportunity to continue advocating for the military even after she retires from duty. For some members, the induction of female members was an inconceivable idea just a few decades ago. “People used to joke, ‘What will our wives say if there were women in the company?’ ” Colella recalled. But Ancient and Honorables membership is an honor, Colella said, and he believed women should have the opportunity to be included. “Women spilled their blood for this country,” Colella said. Approval for Hoffmann and Corkery was not quite unanimous. A handful of members — about 3 percent of those who voted last week — voted against membership for the women. Hoffmann said the few voices of dissent did not bother her. As a woman in the military, she said, she knows how to succeed in an organization often considered predominantly male. She expects this will be much the same dynamic. She hopes she will win over those dissenters with her leadership style, commitment to excellence, and her plans to recruit other upstanding servicemen and women. Hoffmann said she knows of at least one other woman who is already making plans to apply. Colella compared the induction of the two female members to the acceptance of other minority members in the organization. It was only a few decades ago, he said, that the group inducted its first black member. Before that, Irish-American men and Jewish men were persona non grata.